Next WPC preparation puzzle, this one from round 5, Variations. You might as well call it a First Seen No-Islands Tapa. 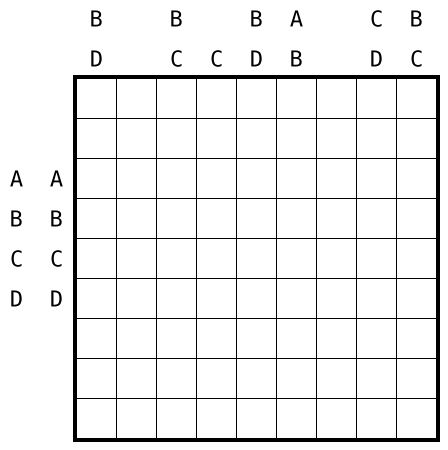 Rules Shade some empty cells to form a Coral, compare Puzzle 27. The clue cells count as empty cells for the coral and can not be shaded. They indicate the lengths of the first blocks seen in each of the up to four directions. Or better see the instruction booklet. This entry was posted in Puzzles and tagged coral, inner coral, variant, wpc on 2018-11-14 by rob. Feels like anything can happen with coded puzzles… Here’s one that’s probably of medium difficulty as far as coded corals go, though the puzzle type seems to be inherently difficult. 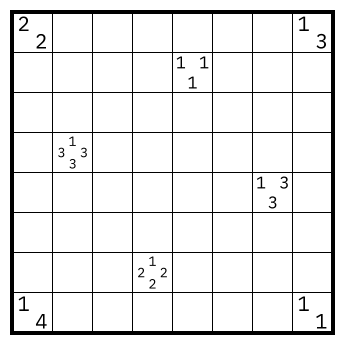 Rules Map the letters to distinct positive numbers, and solve the resulting Coral puzzle: Shade some cells, such that all shaded cells are connected by edge, such that no 2-by-2-square is fully shaded, and such that all unshaded cells are connected to the puzzle border by edge. For clued rows and columns, the clues give the lengths of all connected blocks of shaded cells, in any order. This entry was posted in Puzzles and tagged coded, coral, hard, practice, variant on 2014-04-23 by rob.